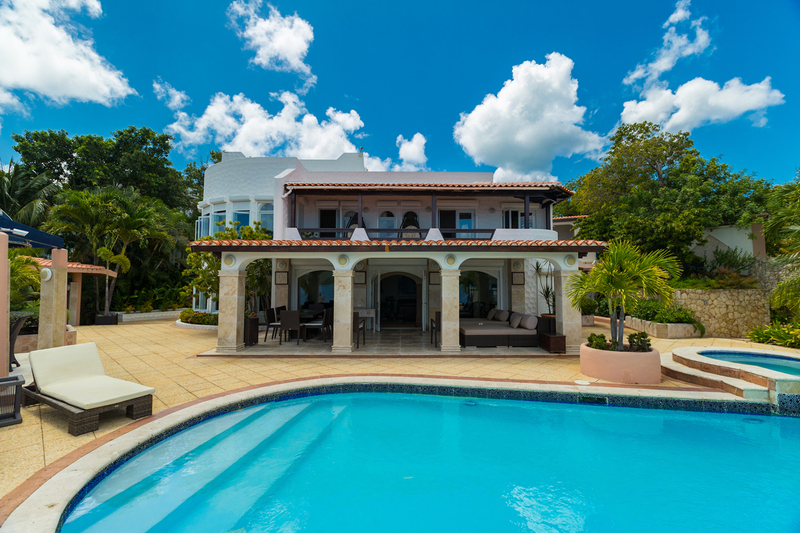 Cielos Azules – Luxury, waterfront 4 plus 1 Bedroom, 4 ½ bathroom villa located in the gated community of Pointe Pirouette…This is truly a very unique villa with its own private boat dock. 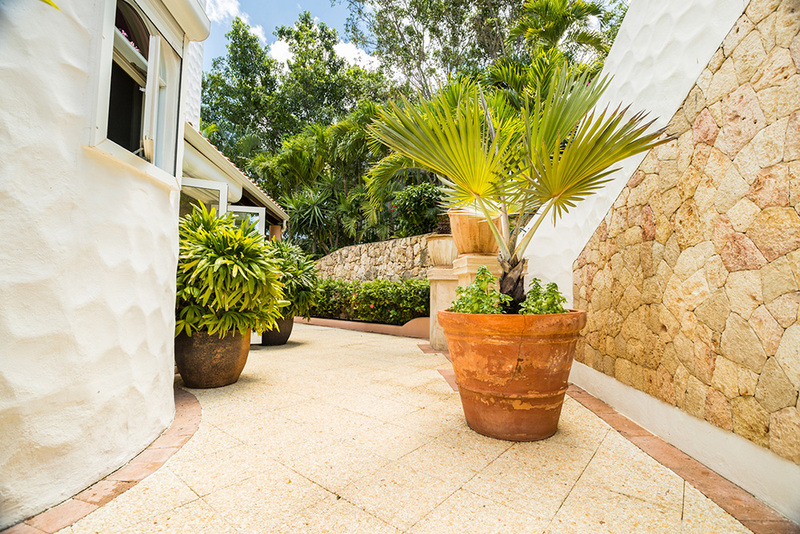 From the moment you enter the wonderful courtyard area, you feel like you have just entered into your very own special place of the island for your vacation rental experience. 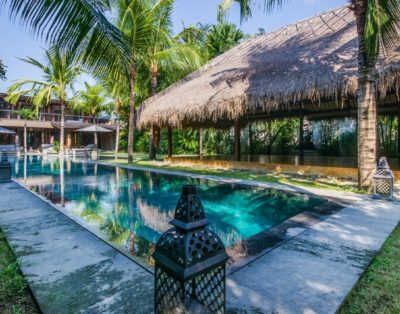 The villa’s three level space, rooms, terraces and private pool join together to create a wonderful flowing space… This gorgeous villa is completely equipped with every convenience needed for a spectacular vacation. 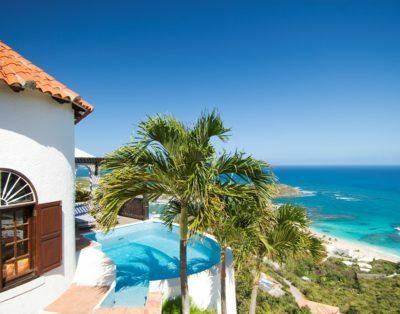 Exquisite use of textures and warm colors create a perfect mix of luxury island style living with all the modern amenities and conveniences. 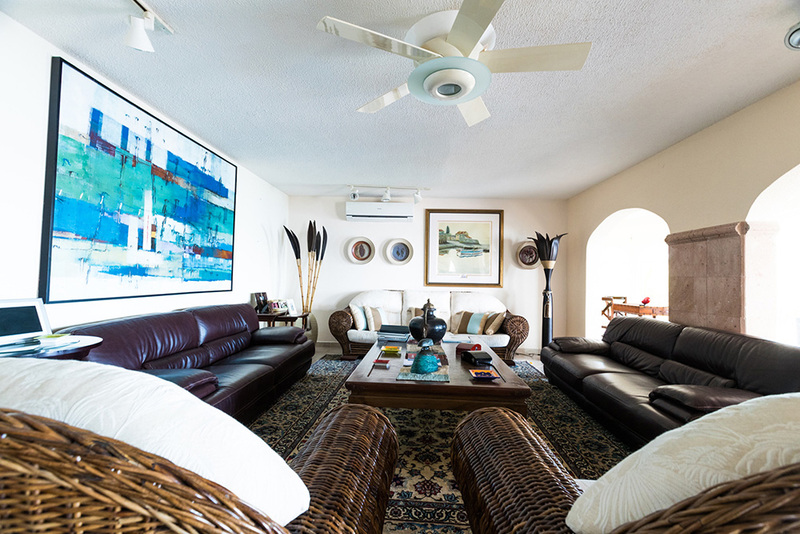 The living area, furnished with elegant furnishings, offers a spacious area for family or friends with plenty of comfortable seating. 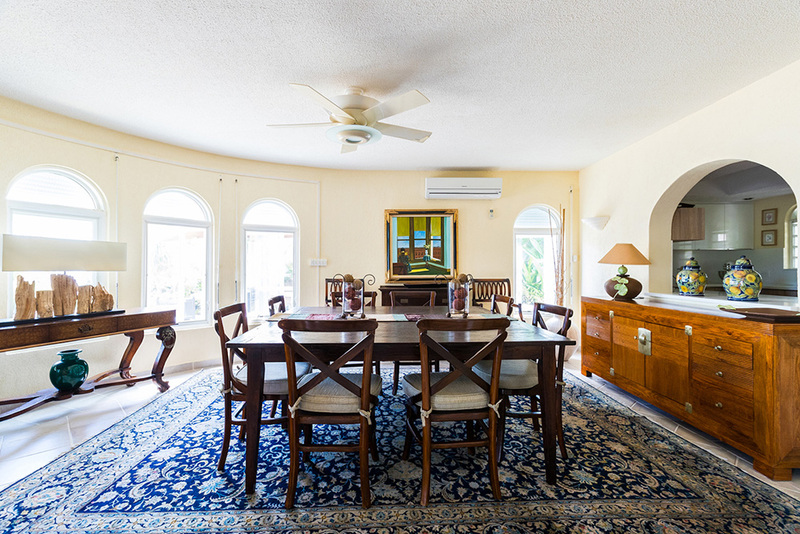 The indoor dining room area offers seating for 10 persons. The impressive gourmet kitchen is a dream for those of you who love to cook. The kitchen, recently refurbished, features stone counter tops, modern cabinets, modern state-of-the-art deluxe appliances including 3 door refrigerator, 4 burner stove, double oven, wine cooler, dishwasher, place settings, silverware, accessories and fully equipped for you to make that gourmet meal. 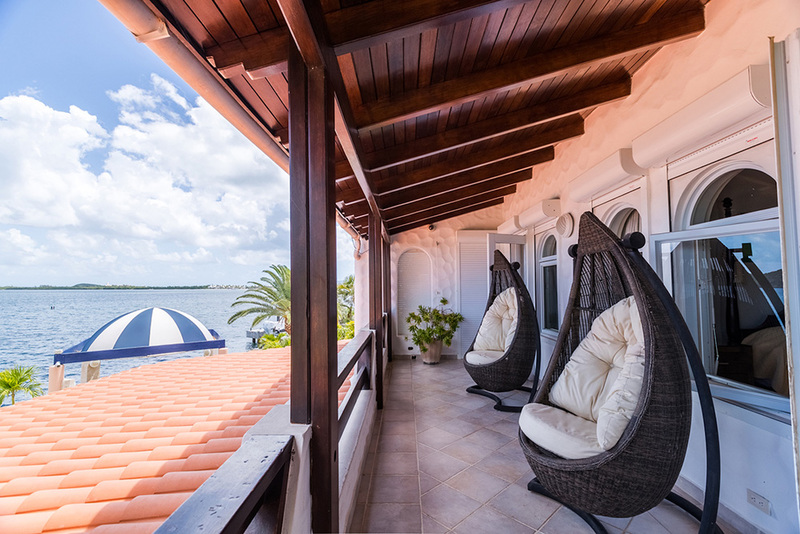 The outdoor expansive terrace area on the main level features a large pool, gazebo/bar area and your own private boat dock! 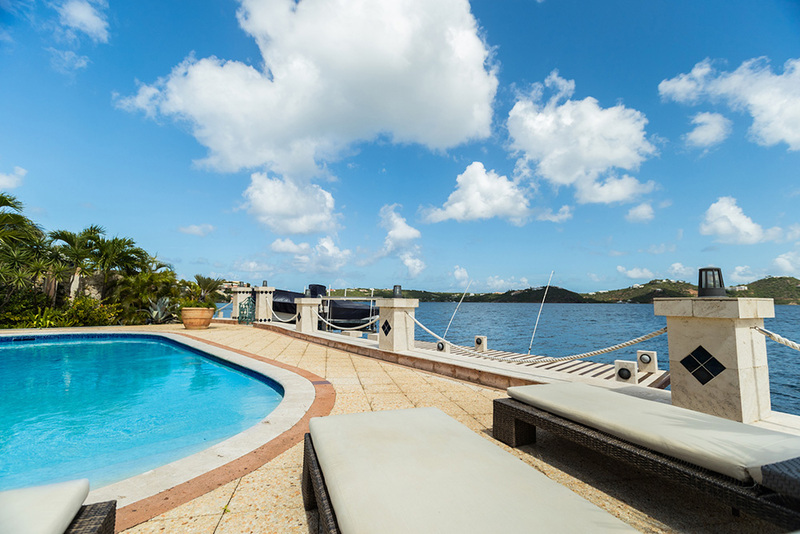 It is a wonderful area you may enjoy the direct water views and gentle trade winds. 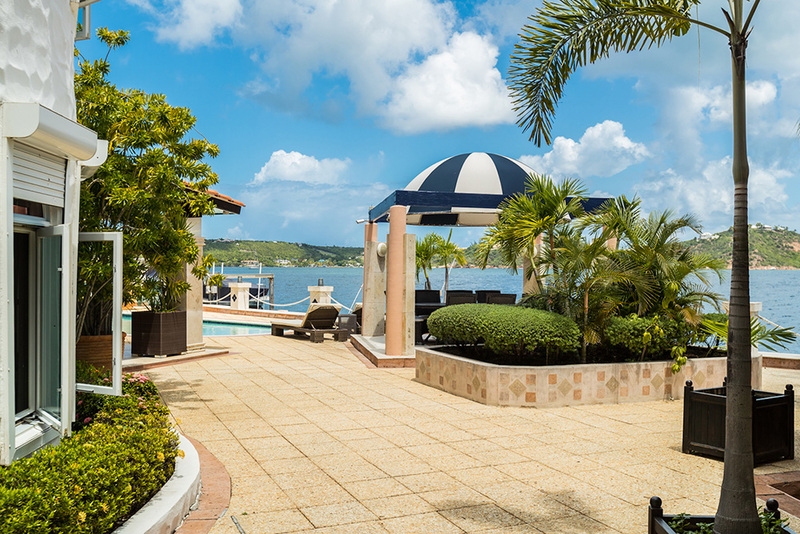 By the pool area, there is a comfortable seating and dining under the covered terrace area and lounge chairs for you to bask in the Caribbean Sun. 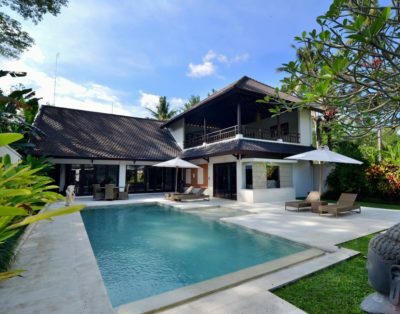 The villa features 4 plus 1 bedrooms. 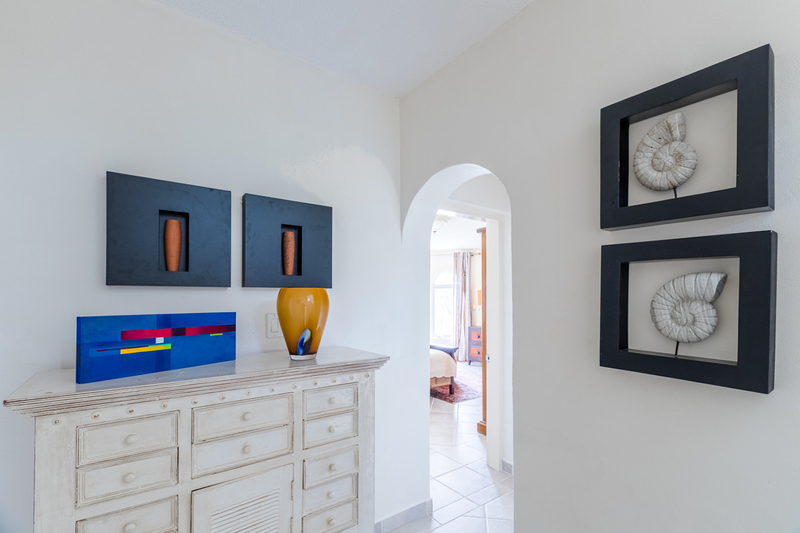 One guest bedroom is located on the entry level, same level as the living/dining, pool and kitchen area…This bedroom offers a king size bed and bathroom with single sink and shower. The 4th bedroom features a king sized bed and connects to a smaller bedroom available for an extra $500 per week. 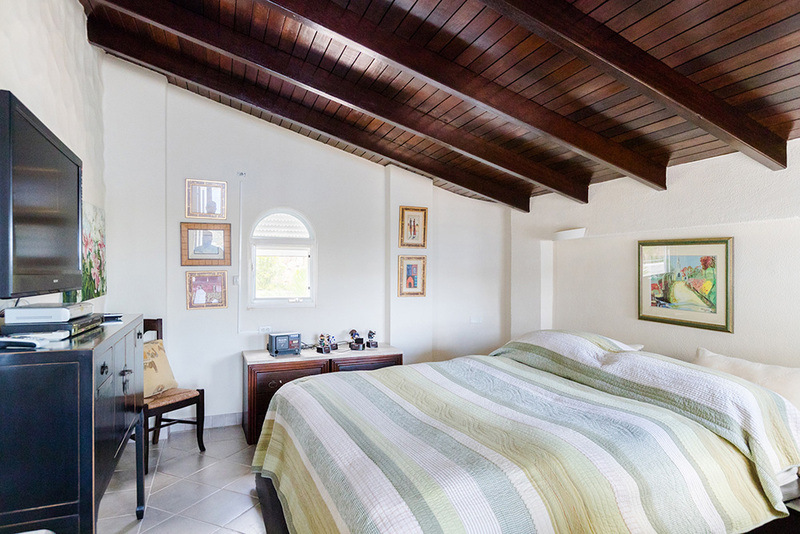 The master bedroom and 3 additional guest bedrooms are located on the second level…The master bedroom offers a king bed with an en-suite full bathroom featuring tub, shower and bidet. 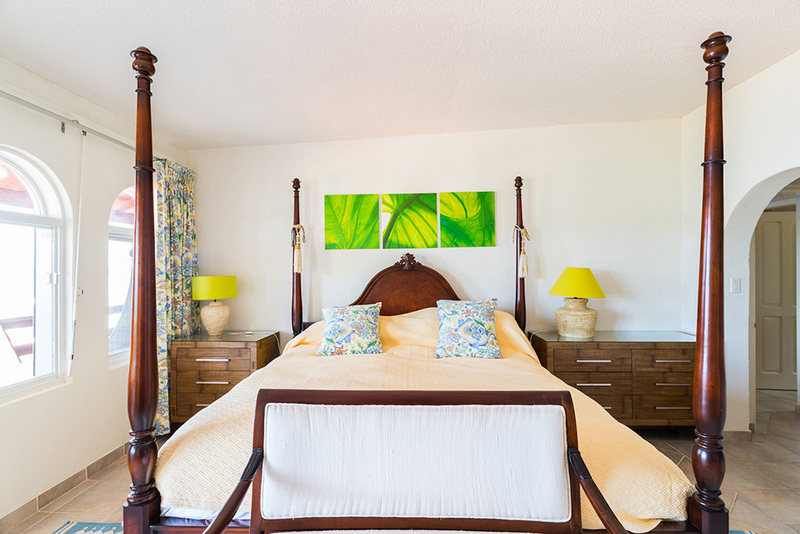 The 3rd bedroom offers a queen bed and the bathroom is across the hall from this bedroom. 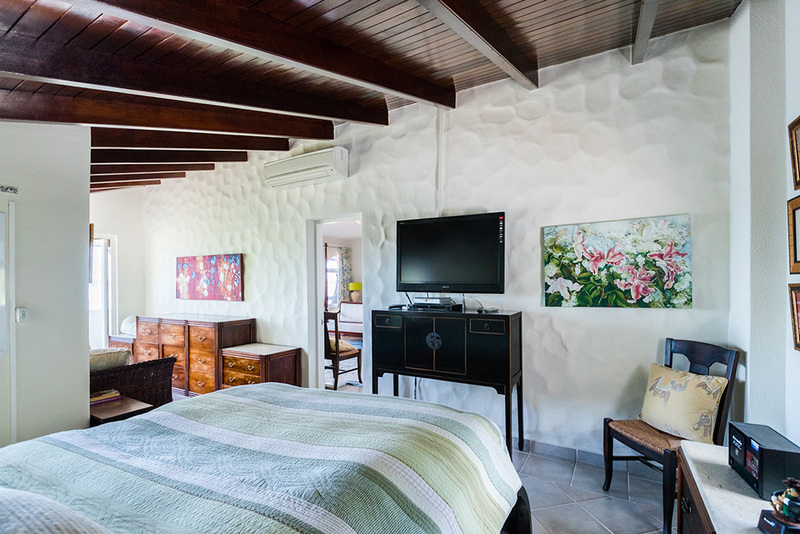 The master bedroom and 3rd bedroom open onto the 2nd level private terrace area. 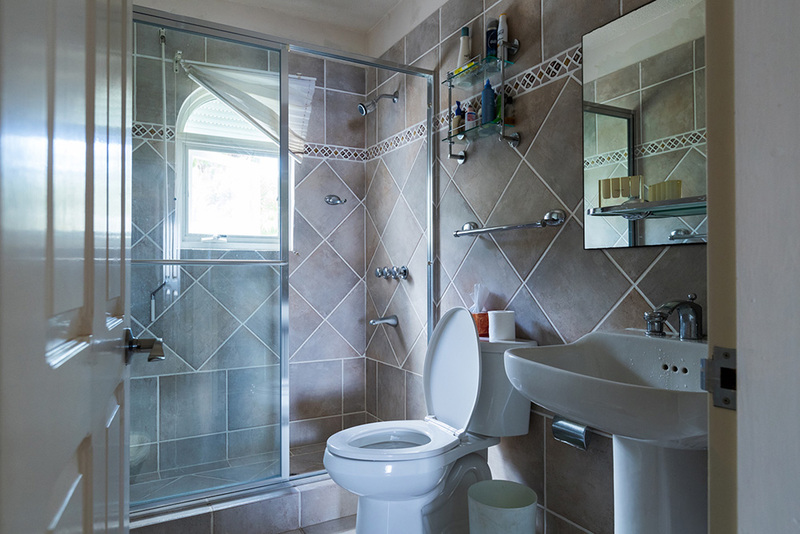 The 4th & 5th Bedrooms feature a king size bed in each room and are connecting to each other with one shared full bathroom featuring tub, shower, double sinks and walk-in closet. 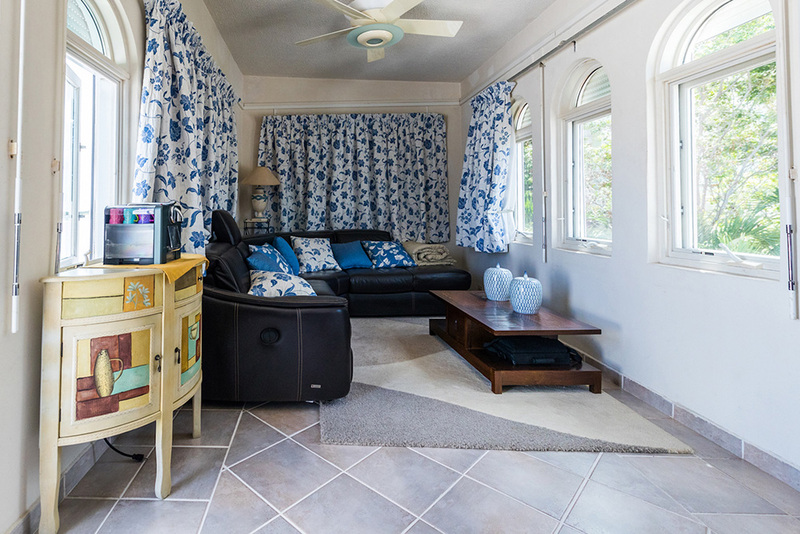 On the top 3rd level of this villa, there is a separate family/TV room for your entertainment pleasure to include large flat screen TV and DVD player. 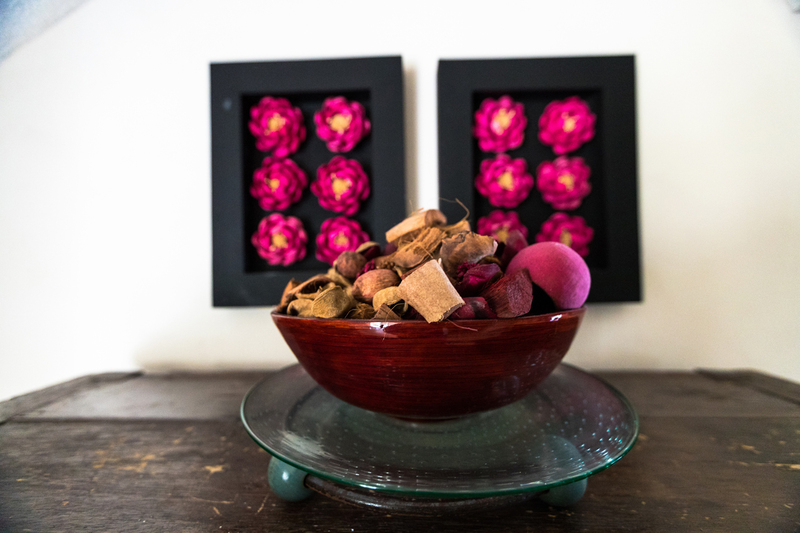 In addition, enjoy the views from the private terrace on the 3rd level. 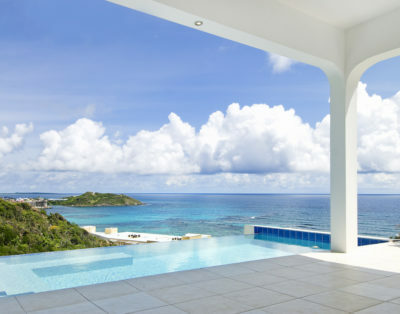 The Beauty of St. Maarten/St. 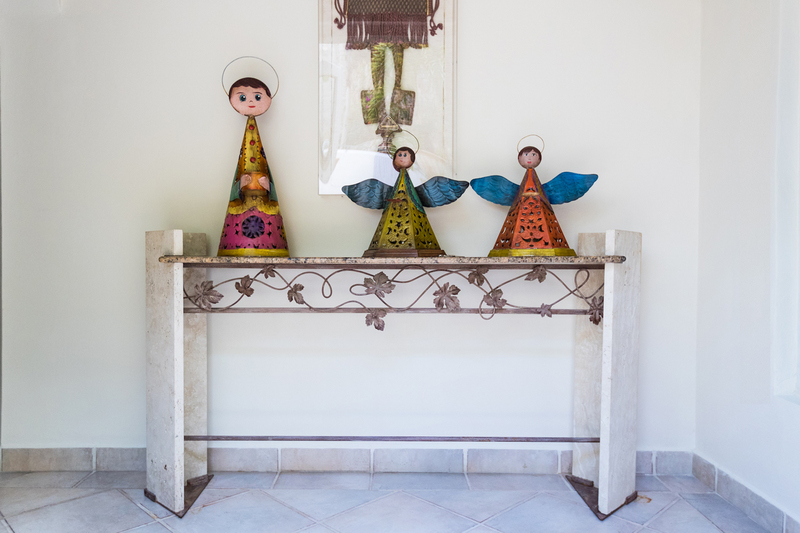 Martin and its cultural diversity make our Island truly a one-of-kind adventure. 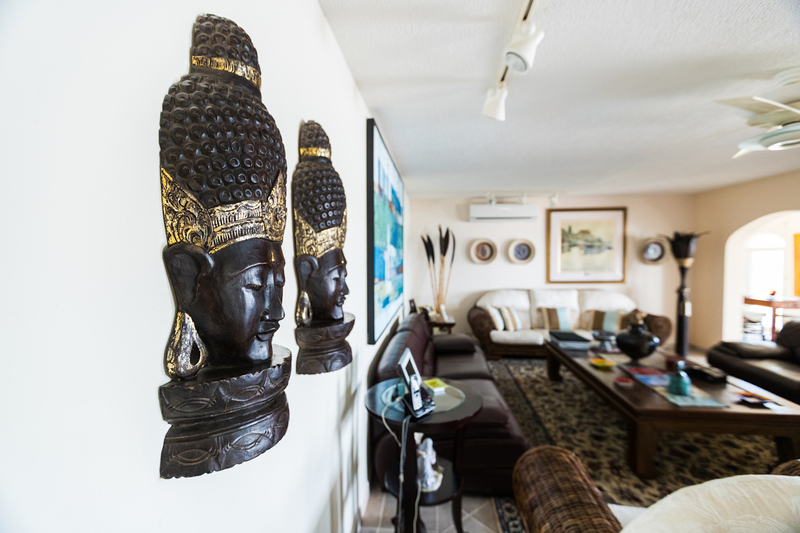 The charm comes from the mingling of French, Dutch and West Indian traditions, fine boutiques, duty-free shopping, scrumptious dining, entertaining nightlife and an abundance of land and sea excursions. 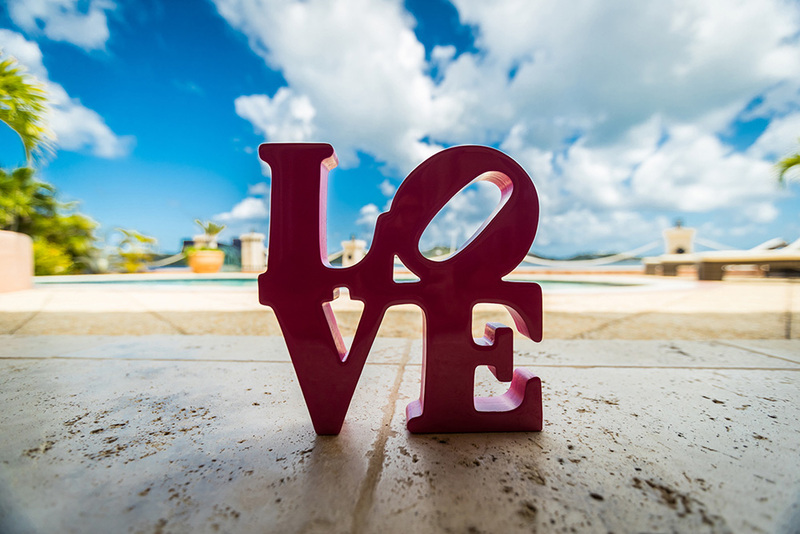 Whether you desire tranquility, exciting nightlife or a lively adventure on the sea, St. Maarten/St. Martin offers it all. PLUS the location couldn’t be any better. 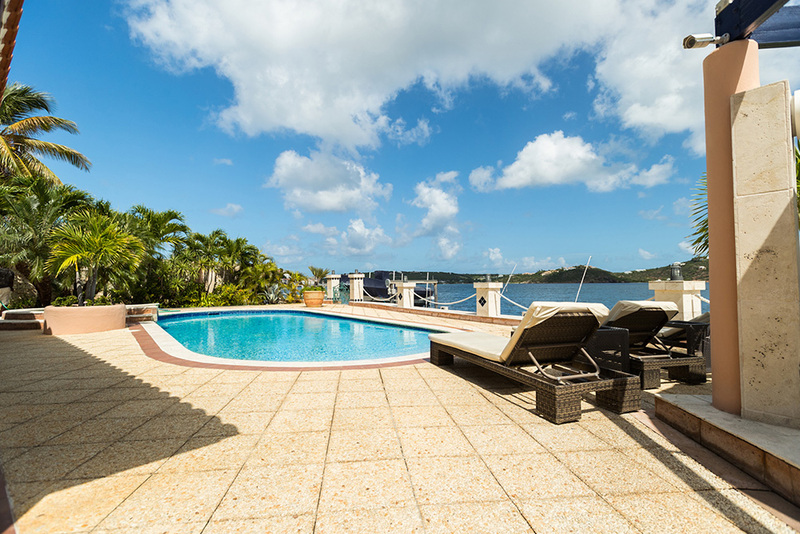 Conveniently located a few minutes away from Mullet Bay Beach or Maho Beach. 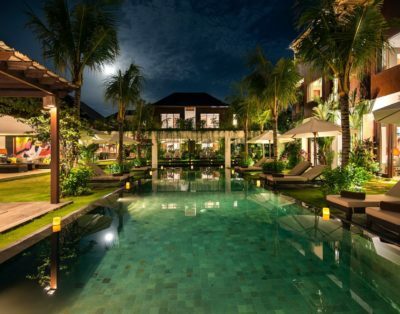 Close to the airport, dining, shops, casino and nightlife at Maho plus casino and restaurants at Atlantis; the famed La Samanna Hotel and the charming French capital town of Marigot are ALL 10 – 20 minutes away! 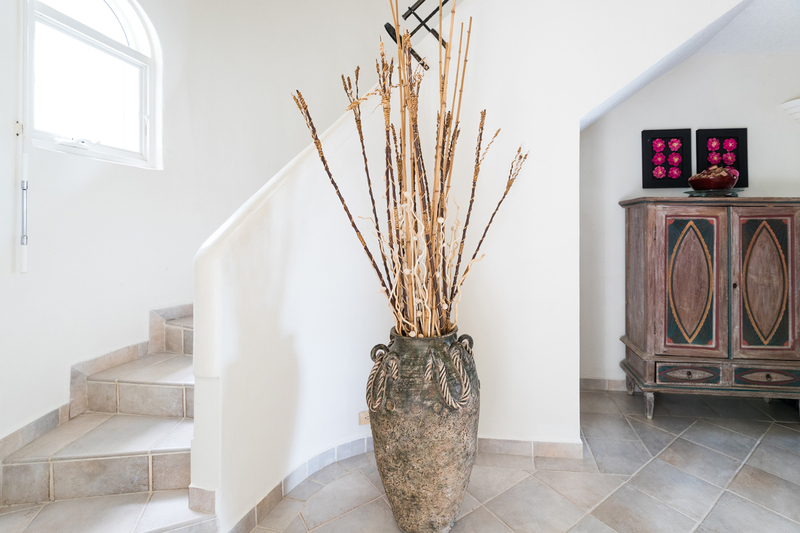 At Cielos Azules, have a truly UNFORGETTABLE EXPERIENCE…Come and experience this amazing villa for a taste of the luxury Caribbean lifestyle…A true oasis of calm, luxury and elegance! 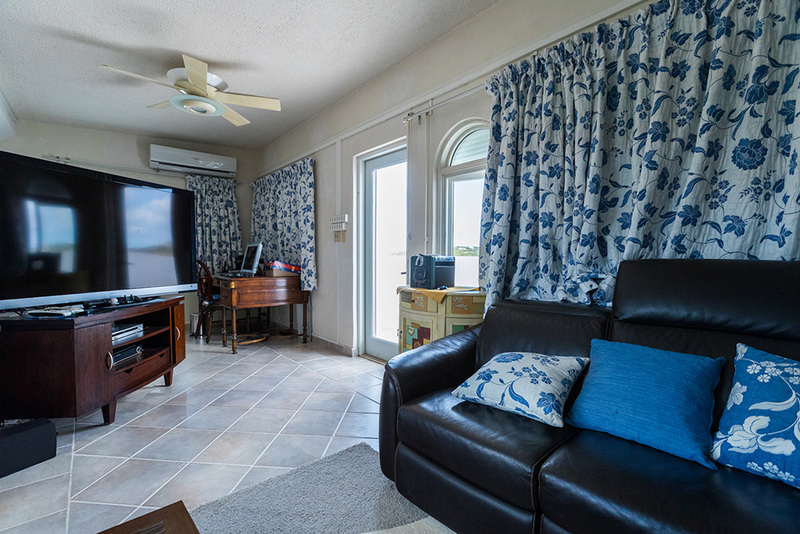 Master Bedroom 1 – The Master Bedroom is located on the 2nd level and features a king-size bed, air conditioning, ceiling fan, safe and spacious closets. 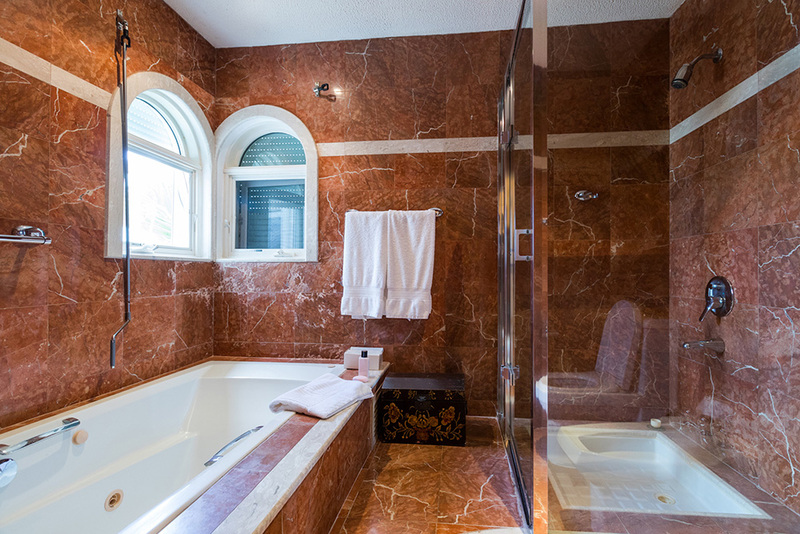 The en-suite full marble bathroom is equipped with a tub, shower, single bowl sink, bidet and spacious closets. 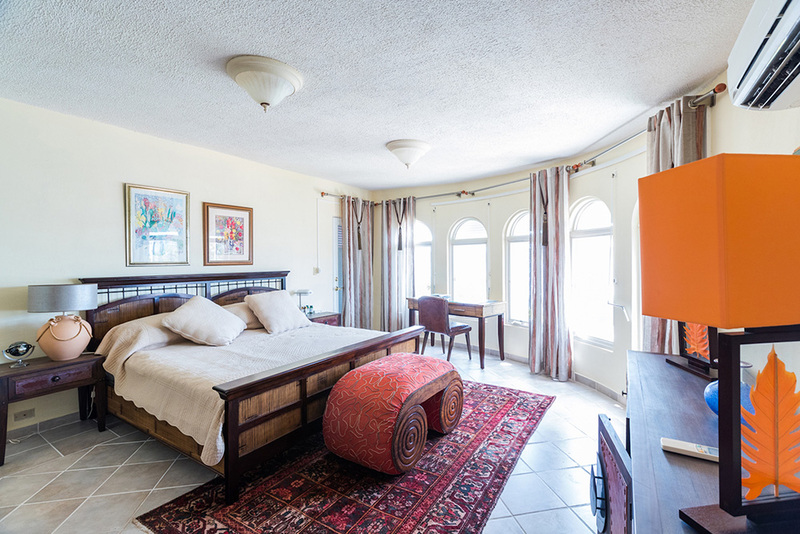 Bedroom 2 – The second Bedroom is located on the main level and features a king-size bed, air conditioning & ceiling fan. 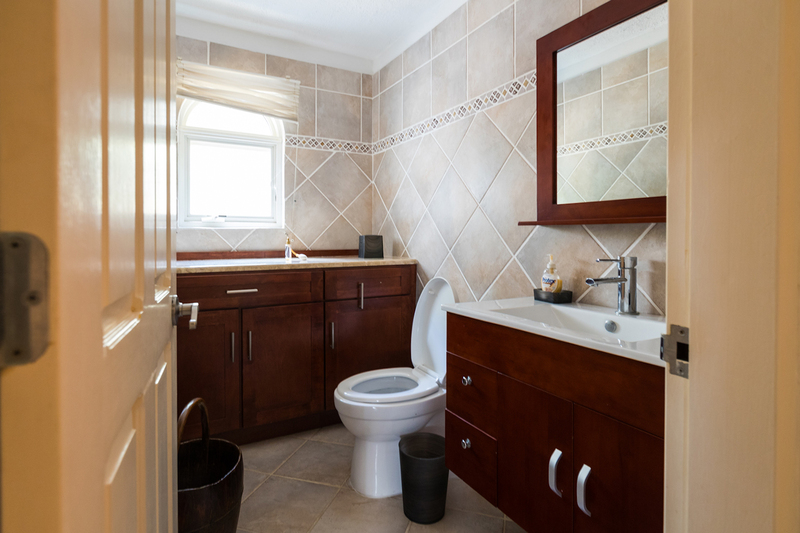 The en-suite bathroom is equipped with a shower, single bowl sink & closet space. 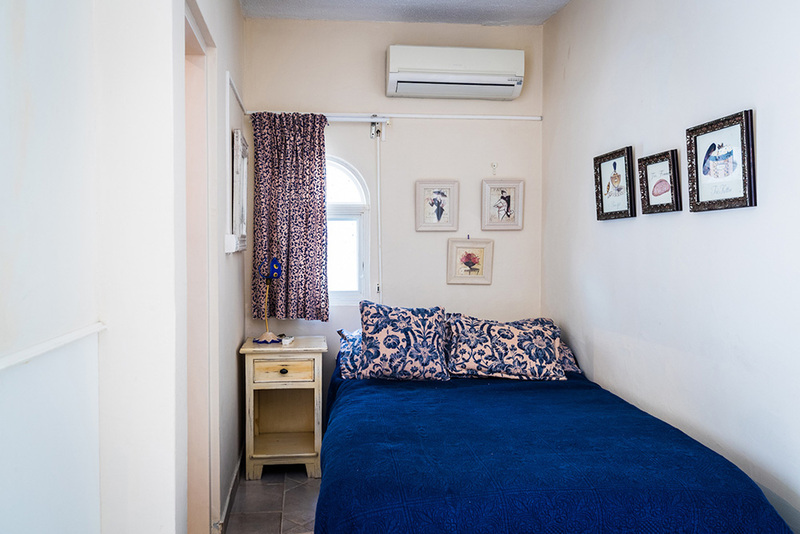 Please do note that connected to this room is a small room with double bed that would great as a Nanny room. 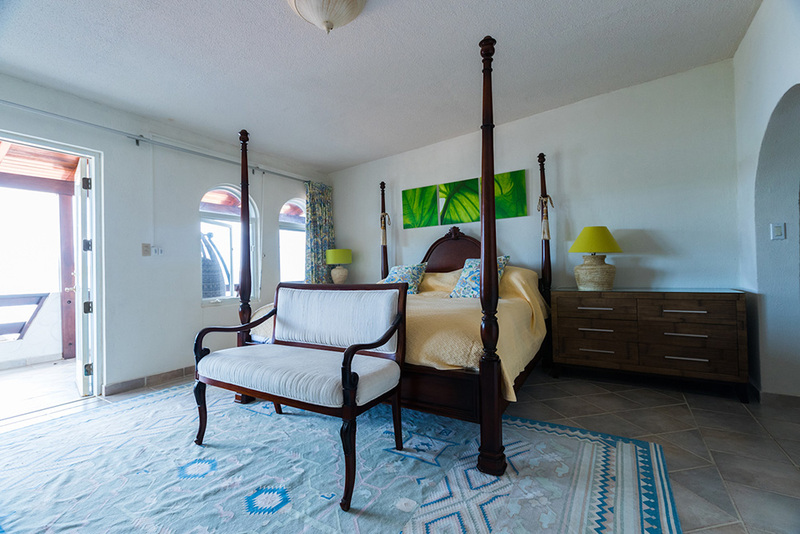 Bedroom 3 – The third Bedroom is located on the 2nd level and features a queen-size bed, air conditioning, ceiling fan and spacious closet. 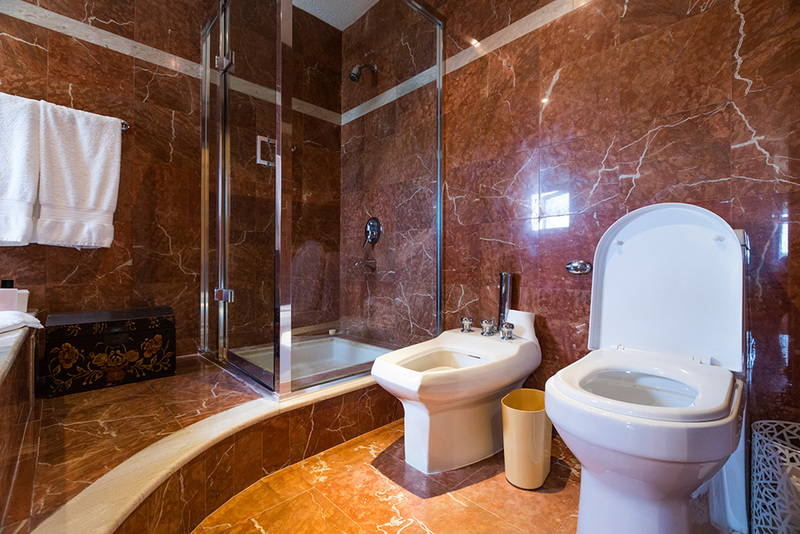 The bathroom is across the hall and equipped with a shower and single bowl sink. 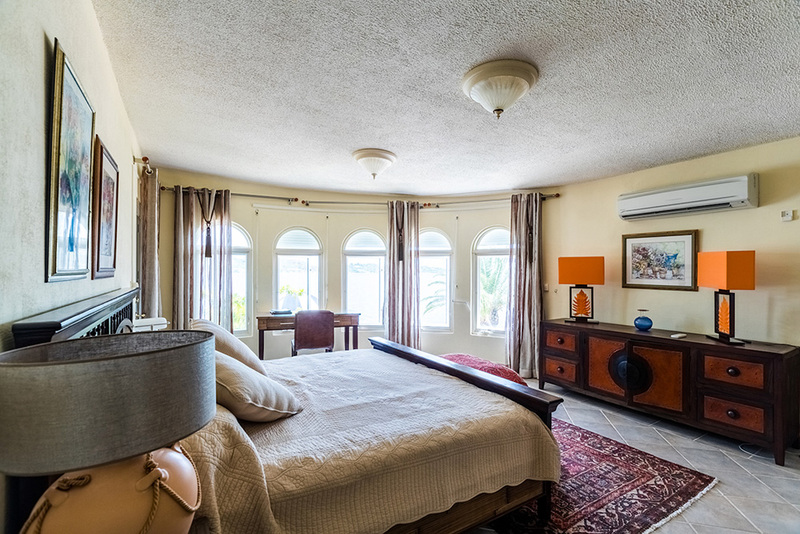 Bedroom 4 & 5 – The fourth & fifth bedrooms feature a king-size bed in each room, air conditioning, & ceiling fan. 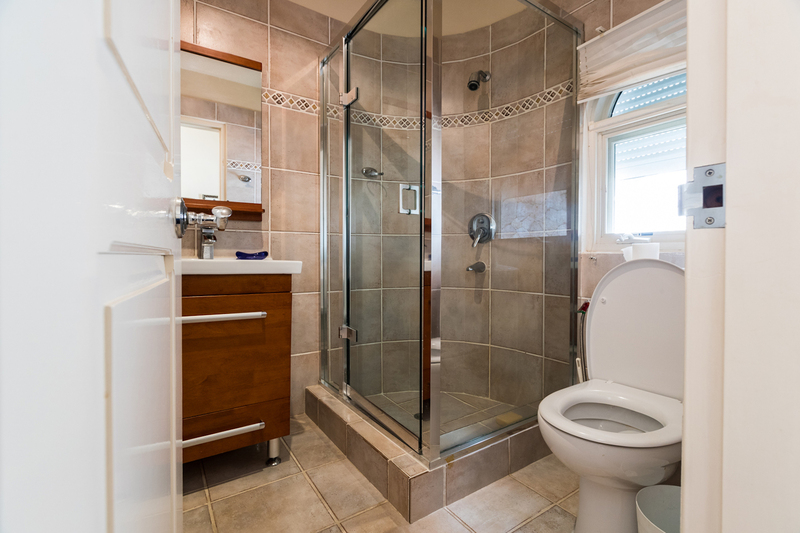 These two bedroom are connecting to each other with one shared full bathroom equipped with tub, shower, double sinks and walk-in closet. 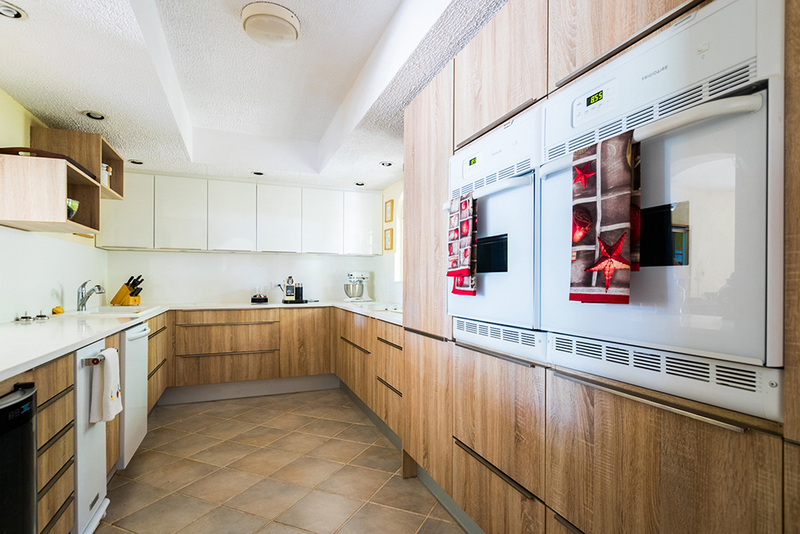 The impressive gourmet kitchen is a dream for those of you who love to cook. The kitchen, recently refurbished, features stone counter tops, modern cabinets, modern state-of-the-art deluxe appliances including 3 door refrigerator, 4 burner stove, double oven, wine cooler, dishwasher, microwave, toaster, blender, coffee maker, place settings, silverware, accessories and fully equipped for you to make that gourmet meal. 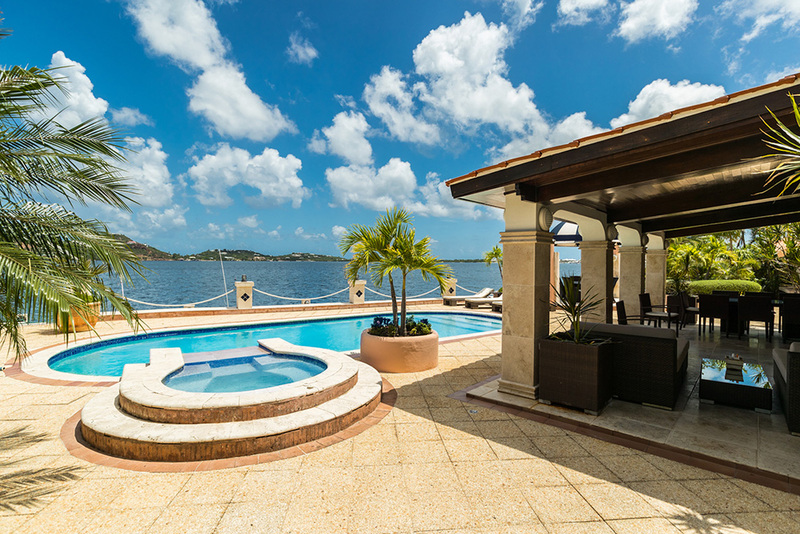 The outdoor expansive terrace area on the main level of the villa features a large pool, gazebo/bar area and your own private boat dock! 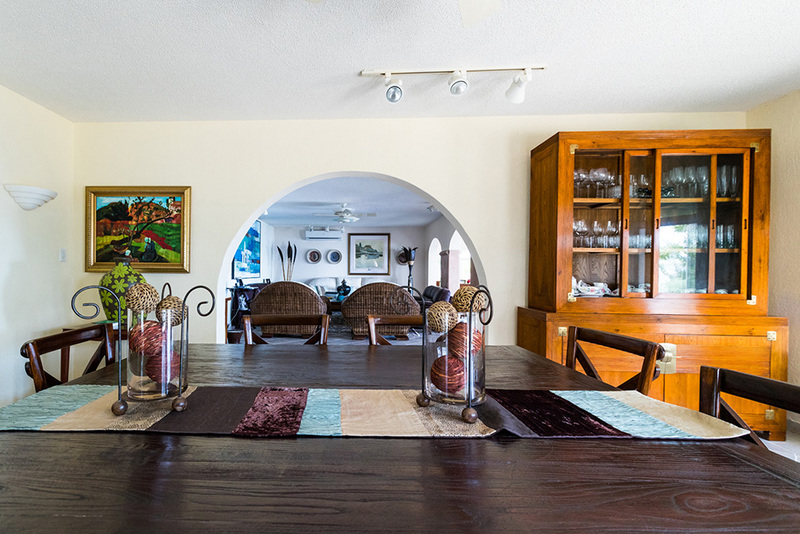 It is a wonderful area you may enjoy the direct water views and gentle trade winds. Princess Juliana International Airport – 5 minutes, Philipsburg, the Dutch capital – 35 minutes, Marigot, the French capital – 20 minutes, Nearest Casino – short drive to Casino Royale at Maho or Starz Casino (few minutes), Maho entertainment area & restaurants – short drive away (few minutes), Blue Mall – 10 minutes, Simpson Bay – 10 minutes.